Given the strong progress the Group has made, the Board announced an acceleration of, and an increase to, the Capital Return Plan on 23 February 2016. Minimising financial risk and retaining flexibility for reinvestment in the business remain key priorities. The Board is of the firm belief that the prioritisation of capital discipline through the housing cycle is critical to the successful delivery of sustainable, superior shareholder value and, therefore, maintained the original long term Capital Return Plan period commitment to 2021. This week we choose a special situation in an area of recovery. 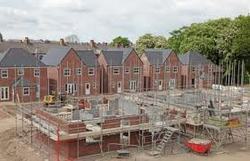 U.K housing is underpinned by strong fundamentals. Basically, too many people, too few houses. On an affordability basis i.e income to house prices, they are not cheap, but sustained low interest rates help to remedy this. The government is helping indirectly here by providing stimulus to the banks through a very loose monetary policy. Once the banks stop rebuilding their balance sheets, they will focus on doing what they are meant to. Taking deposits and lending on an interest rate differential.